A visit to the European Egyptian Event at Castle Dyck is the best way to briefly – and legally – escape from reality. For a whole weekend, ethereal, elegant and exquisite Straight Egyptian Arabian horses played the lead plus the moated castle as a backdrop. Following the successful première in 2016, it was a warm and heartfelt welcome back for Straight Egyptian Arabian enthusiasts from all over the world at the Egyptian Event Europe (EEE) at Castle Dyck in Jüchen near Düsseldorf, Germany. Again the EEE was so much more than "just" a show; the event offered again various encouraging and inspiring lessons at various levels. The cordial hosts Heike and Manfred Hain and their team organized the EEE for the second time on behalf of the Pyramid Society Europe and never got tired making everything right. The board of the Pyramid Society Europe, which celebrates its 30th anniversary in 2017, ensured support as well. The list of participants included well-known stud farms mainly from the Middle East and Europe. The most competitive breeder from Europe was, without question, Nayla Hayek of Hanaya Stud, Switzerland. 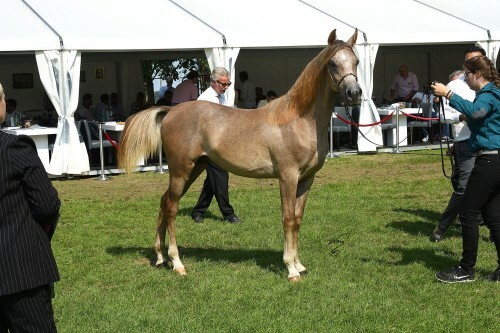 The Straight Egyptian Arabian is of special concern to her and by participating with quite a number of horses at the show she supports this breed and the EEE likewise. In the end, Hanaya's horses garnered several achievements. Starting with the Gold Champion Junior Filly Hanaya Amirah, by Kenz Al Baydaa, besting AB Faridah, by DF Malik Jamil (Abhaa Arabians, Kuwait) and Al Baydaa Farm's Turkiz AA, by Al Ayal AA. Nayla's exceptional mare Wadad Zamani, reigning U.S. Egyptian Event Unanimous Gold Champion Senior Mare, became Silver Champion Senior Mare and Best In Show – Female (highest points), while her stablemate Nadeed Al Naif gathered Bronze Champion Senior Male. For sure, the most accelerated decision was the senior stallion championship. Dubai Arabian Horse Stud, UAE, went away with Gold for the Barraq El Aliya son Asfoor Al Waab. 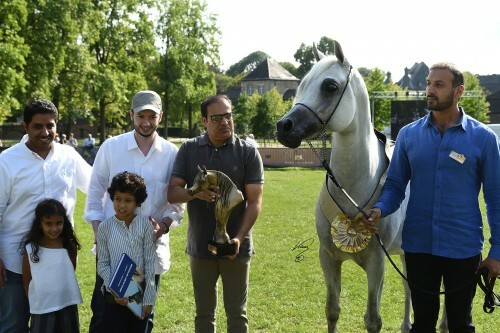 Silver went to Al Farida Stud's Adham Saqr, an Imperial Madori son, who also won Best In Show – Male (highest points). Talking about impressive stallions, there was another stallion that is left to be mentioned: Ansata Nile Echo, winner of the Best Sire Award (determined by a point system). It was in December 2016, when Al Naif Stud, owned by Sheikh Abdulla Bin Nasser Al Ahmed Al Thani, Qatar, announced the loss of its valued stallion Ansata Nile Echo, also known as the "King Of Trot". Born on the green field of Ansata Arabian Stud, Arkansas, and exported as a weanling to Qatar. Sired by influential Ansata Hejazi, Ansata Nile Echo became a worthy member of the famous Ansata Nile family and he exemplified the noble traits of this line. Not only due to his international accolades but above all thanks to his fantastic get. 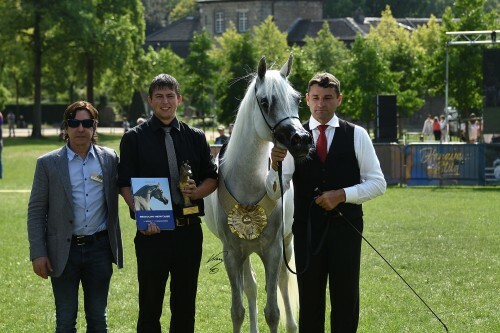 At the EEE, the Ansata Nile Echo son Helal Al Fala achieved Gold Champion Yearling Colts, proudly owned by Al Fala Stud, KSA, with PSE Al Jabbar, by PSE Al Rakhan and owned by Prestige BVBA, BEL, winning silver while once more a Hanaya bred horse garnered a medal. This time it was bronze for Hanaya Habib El Ezz, by Ezz Ezzain. The senior mare classes were of outstanding quality all worth to wear one of the diamond-encrusted, stylish show halters of Animal Style which experienced a world premiere at the EEE. Gold Champion Senior Mare was awarded to Al Danat Stud's Sinan Al Rayyan daughter Shalwa with aforementioned Wadad Zamani winning silver and Dubai Arabian Horse Stud's D Omnia, by Frasera Mashar receiving bronze. By the way, it should also be noted that the state stud farm Marbach, celebrating their 200th anniversary in 2017, presented some horses. 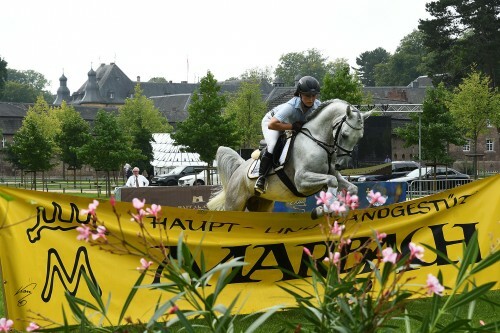 Three Straight Egyptian Arabian stallions performed under saddle: Musab, a bay NK Bolbol son, Naoufil, by Mahadin, and Mamlakee, by DF Malik Jamil, all representing the two dam lines Moheba and Nadja respectively. But Marbach also sends some mares to compete, though they were among the blue ribbon winners they had won the hearts of the audience thanks to the natural way of presentation and powerful, articulated movement. It was heartwarming to see German Sandra Zänglein's overflowing happiness winning the Amateur Class Senior Mares, presenting the Salaa Maysah daughter Rheemal Al Jabal for Al Jabal Arabians, Switzerland. The Amateur Class Stallions saw just one participant but the young Azeem Al Aqaba, bred and owned by Waltraut Hobein, was present in a very nice way. The Egyptian Event Europe is not an only social meeting point for enthusiasts and breeders from all over the world; the event always includes a lecture. "This year, we could invite a distinguished expert in the field of Straight Egyptian Arabians, thanks to financial support from Kuwait's state stud Bait Al Arab," says Bettina von Kameke, President of the PSE. 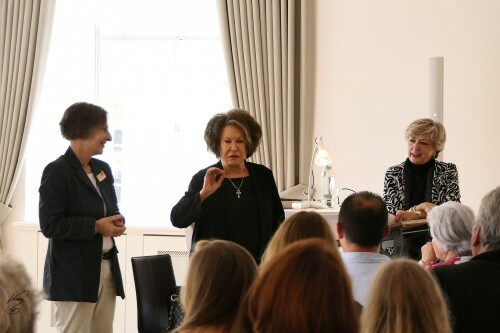 "We feel honored and proud that Judith Forbis made the long way from the United States to our Event to talk about a life long breeding venture and the background stories of her new book ‘Ansata Hejazi – Born To Rule'." Of course, Judith Forbis took her audience and talked about divine coincidences and history repeating itself within the Arabian horse scene. It was emotional, inspiring and instructive to listen to the Grande Dame of Straight Egyptian Arabian horse breeding. PSE chairwoman Bettina von Kameke gave a speech about 30 years of PSE during the breeders evening. Thanks to the Seidlitz family and photographer Carola Toischel some photo treasures from former EEE were presented in a slide show to the audience. It was touching to experience the reactions of several persons present commenting the photos. The photos of late Erwin Escher, passionate breeder and photographer, filled the eyes of several people with tears. Willi Poth, a founding member of the Pyramid Society Europe and former organizer of several EEE, also made the most of the opportunity and shared some personal memories. Sunday evening and the end of this marvelous Egyptian Event Europe came way too fast and then it was back to reality. Straight Egyptian horse lovers can't wait until 2018 coming back for another escape from reality at the inspiring Egyptian Event Europe to Castle Dyck. Heartfelt thanks go to the breeders, owners, trainers, handlers, and fans of Arabian horses and to all the generous sponsors who made this show possible. We wish to thank the Egyptian Event Europe organizers and the photographer Jan Kan for partnering with Arabian Horse Results.